As the summer of 2017 drew to a close, the Kindred Spirits who follow this nest were eagerly awaiting the first glimpse of bonded eagles Romeo & Juliet. Right on schedule, Romeo appeared first on August 26, 2017, followed by his faithful mate Juliet the very next day. For a couple of months, the pair renewed their bond and made nestorations in preparation for what was to come. And then, on November 2nd, Juliet laid Egg 1 in the softest of nest bowls, followed by Egg 2 on November 5th. And the wait began! 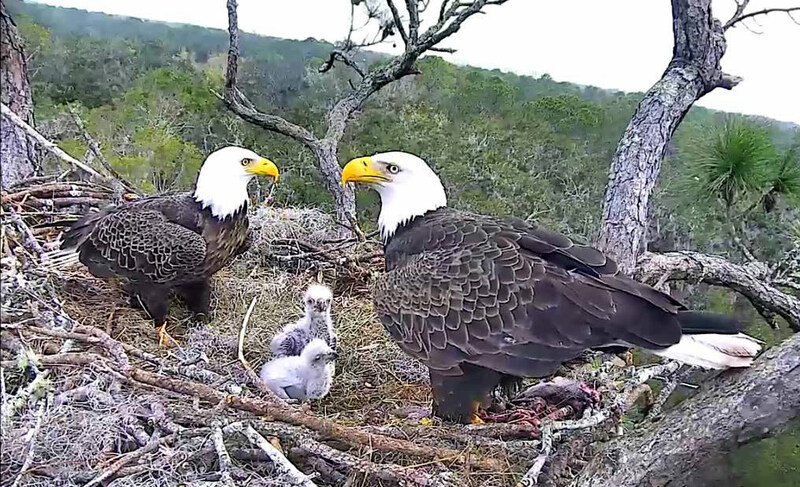 After incubation periods of 37 and 36 days, NE18 hatched on Dec. 9th, followed by NE19 on Dec. 11th. This was the most glorious of seasons! Except for a barred owl who kept buzzing the sleeping parents perched on the nest tree limbs, there was no angst or drama to cause alarm. The babies thrived, as they have always done in this nest, learning new skills and changing in appearance each week—growing too fast for most of us, who often wished we could slow down time in order to enjoy each stage for a bit longer. But eaglets grow fast, and in 10 weeks they were as large as their parents — strong young eaglets, with voracious appetites! Romeo & Juliet were great providers, and there was no shortage of fresh food in the pantry. Gaining confidence, flying strong and free, Sky & Spirit left for their own adventures in the wide world of Nature at just over 17 weeks of age; Sky on April 8, followed by Spirit on April 12. We know they have had the best start possible, and wish them safe travel, long life, and families of their own. Romeo and Juliet, with no more parental responsibilities, stayed around a few weeks longer, often seen together bonding, perching, or tidying up the nest. Romeo was last seen on May 3 and Juliet on May 7. They are now off on journeys unknown to us, but we eagerly await their return in the Fall when once again the cams will capture all the important events of their next nesting season. We would not get off the ground if it weren’t for those individuals who volunteer their special skills, their expertise, and their passion – for this nest and this family of eagles. They are the “Village” that makes this possible. The American Eagle Foundation is so grateful for each of you and appreciates all you have done to make this such a special season. For the thousands upon thousands of viewers around the country and the world who watch our cams and support our mission, you inspire and sustain us. Thank you! Memories Of This Season – Videos, Photos, and more! Our marvelous videographers have captured many important moments in the nest over the season, resulting in an enormous YouTube playlist that you can visit whenever you like! In addition, some of the best photos from the season are on our Flickr NEFL page. A Timeline created and maintained by NEFL liaison, Gretchen Butler, documents the history of the nest from 2008 through the current season. Those who are gifted with the art of writing have contributed in another way! We have a PDF document that is chock-full of poems dedicated to eagles in general, and others specific to each of the nests AEF sponsors. Many of our mods, remote cam operators, and ground crew also contributed a special blog post where they shared their favorite stories and memories of the season. AEF invites anyone to post photo and video screenshots/screen-recordings captured from these high definition cams. 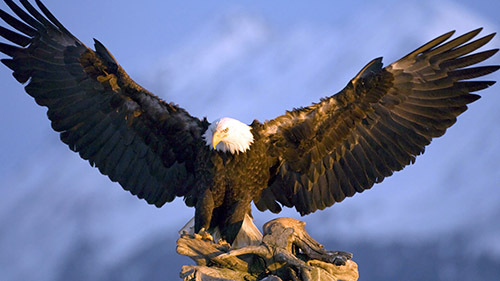 Since these photos and videos can be copied and duplicated over and over, we request that when you post these up to Facebook, IG, Websites, Blogs, or another social media location, the following information be included at the end of your photo/video caption: © 2018 American Eagle Foundation, EAGLES.ORG. These live feeds are the intellectual property of the AEF, and we kindly request that you do not attempt to embed or live stream these feeds on your website, blog, app, etc., or attempt to monetize screen shots or video captures. Thank you for your cooperation! 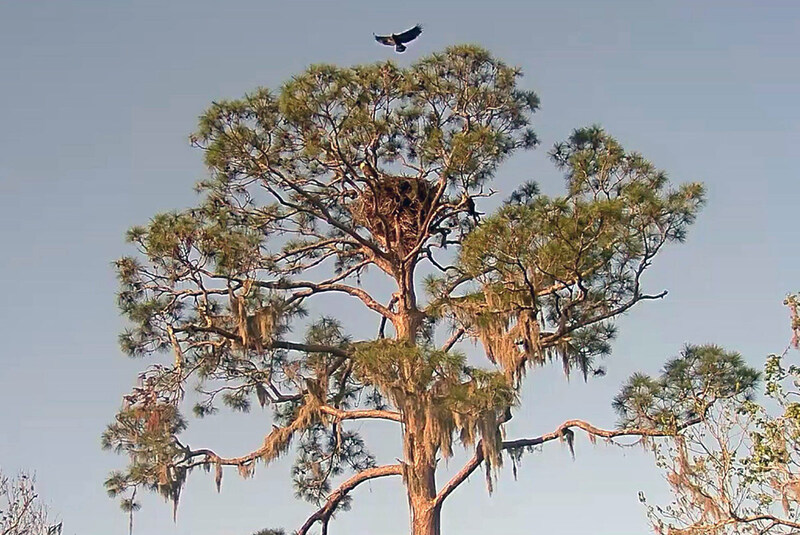 Sky soars over the nest tree, Feb. 23, 2018. ©2018 American Eagle Foundation.